Why do women wear shoes? Well, aside from the primary goal to keep the feet protected when moving around, women wear shoes to boost their confidence. Shoes have become more than just protective body accessories, as throughout time they have evolved into fashion essentials as well. Hence, when shopping for shoes these days, women juggle between essentials such as protection and comfort, and fashion and style. But regardless of today’s fashion trends, it is very important for women to wear shoes that are good to their feet. Not all shoes for women are created equal in the first place-some are made to last a lifetime, others stay trendy for just a season or two, while there are also those that strike a balance between comfort and style. You allow your feet to move with ease. Your feet function so that you are able to move from one place to another. However, they get tired and strained as well after being put to work for several hours-just like the rest of your body. By wearing shoes that are both sturdy and comfortable, your feet are not only able to move with better mobility, but also withstand the stress since they get to relax while in your shoes. Wearing shoes that are good to your feet also helps avoid issues such as muscle strains, tendinitis, and other foot ailments that often hamper your ability to do regular footwork. Your feet are saved from getting injured. A lot of women’s shoes tend to be tricky to wear. These include those that come in high heels, clunky soles, and complicated straps. But not all of these shoe designs are bad for your feet; some of them are specially designed to that when worn, you are still able to move and feel at ease. When shopping for fashionable shoes such as these, it is important that you try them on first and see whether they fit your feet perfectly. The perfect fit means that your feet are comfortable and secure in these shoes, and with the perfect fit, your feet are able to avoid injuries as well. The right shoes make you feel confident. Confidence usually stems from the ground up, thus when your feet are not confident with the shoes they’re in, the same feeling will resonate in your overall persona as well. It is thus a must that you wear shoes that are good to your feet; in the right shoes your feet are able to follow your moves and while at the same time keep you grounded especially in times when you are out of your comfort zone. For most women, shoes that make them more confident are those with high heels, mainly because these give them more height. However, you need not slip into stilettos all the time; you can feel pretty and smart in sneakers, so long as your feet are comfortable in them. You are able to carry your body weight better with the right shoes. Lastly, when looking for shoes for women, it is essential that you check on designs that are able to accommodate the body weight well. Shoes with soles that promote even distribution of body weight allow you not only to move freely and confidently, but also enable you to run, jump, and strut without being at risk to falling or tripping. 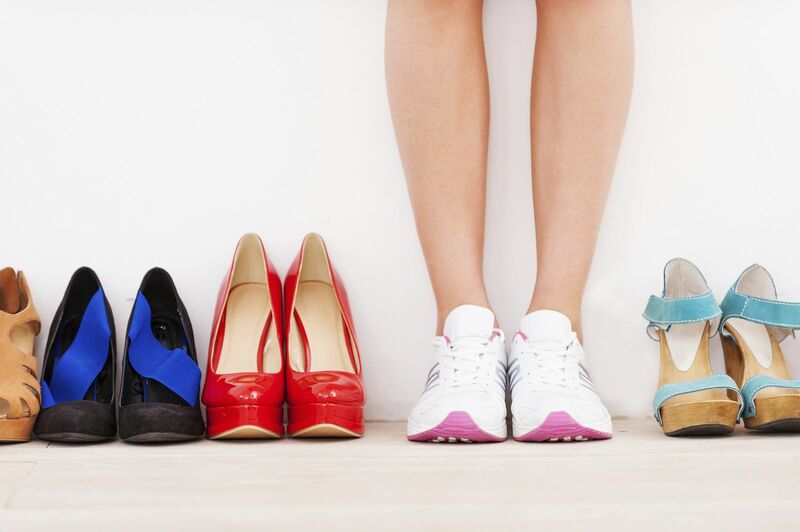 The right shoes help you recognize your weight and distribute it evenly once you step on the ground.